Starting October 16 and for a limited time only, a sneak peek of Disney-Pixar’s epic adventure “The Good Dinosaur” will be presented as part of Walt Disney: One Man’s Dream at Disney’s Hollywood Studios, offering to Guests a special advance look at scenes from the film. The current finale of Walt Disney: One Man’s Dream will go on a brief hiatus during this time, returning on December 5, when the advance look at “The Good Dinosaur” completes its run. “The Good Dinosaur” asks a very interesting question: What if the asteroid that forever changed life on Earth missed the planet completely and giant dinosaurs never became extinct? Pixar Animations Studios takes you on a journey into the world of dinosaurs, where an Apatosaurus named Arlo makes an unlikely human friend. While traveling through a harsh and mysterious landscape, Arlo learns the power of confronting his fears and discovers what he is truly capable of. 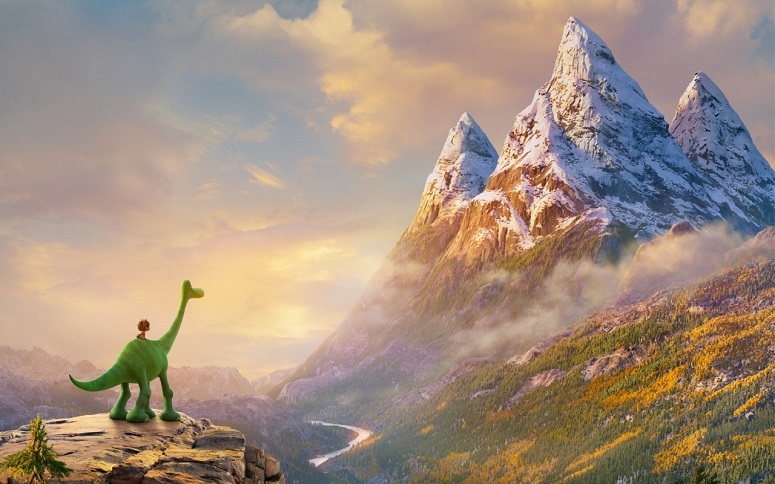 “The Good Dinosaur” officially opens in theaters on November 25, 2015 in the United States. ARTWORK: ©2015 Disney-Pixar. All Rights Reserved. Well, if the asteroid hadn't hit, we likely would have a much hotter planet and human life as we know it would likely not exist. But anyway, looking forward to a fun movie! Why can't they show this in the theatre which Frozen was in before it moved? Andy, I bet they're reserving the big theater for Star Wars.